Membership Add-ons provide a way for members to purchase something in addition to their membership that bills on a recurring basis. 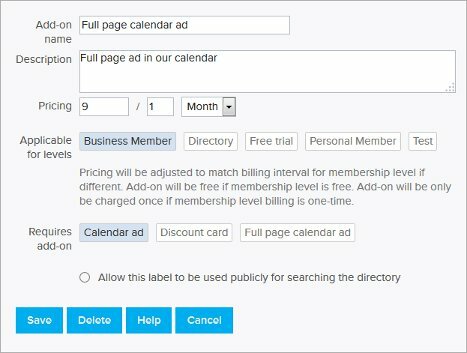 Some great ways to use membership add-ons are to sell calendar ads, website ads, discount cards or listing in a category in your directory. To begin, go to Labels & Memberships > Membership Add-ons. Then click on “+ Add Membership Add-on” to get started. Next give the add-on a name and description. This will be shown on the membership signup form. You can set the price to recur every so many months or years. The add on will bill at the same time as the membership payments, and will be prorated accordingly. For example if you have an add-on that is priced at $120 a year. Members who are on an annual billing cycle will be charged $120 each billing period. Members who are on a monthly billing cycle will be charged $10 each billing period which totals $120 a year. Free memberships: Please be aware that membership add-ons only charge when a membership charges. If a member signs up for a free membership, there are no membership charges, so they will NOT be charged for any membership add-ons. Memberships with one-time/lifetime billing: As membership add-ons only charge when a membership charges, they will not be recurring when a member is on a one-time billing plan. Therefore the add-on will be billed once when the member signs up, but no further membership add-on charges will occur after that. You can make your membership add-on available to some levels and not to others. Click on the membership levels next to “Applicable for levels” to enable the add-on for that membership levels. Selected membership levels will be highlighted in blue. When a member is signing up or updating their membership, they will only see the add-ons that are available to their membership level. You may have a membership add-on that requires another membership add-on. For example you may have a membership add-on for a newsletter ad, and another membership add-on that lets members upgrade to a larger ad. In this case you can select which membership add-ons are required next to “Requires add-on”. This add-on will only be visible when the member selects at least one of the required add-ons. Membership add-ons are also labels. You can make a membership add-on a category in your directory by choosing “Allow this label to be used publicly for searching the directory”. You can update a member’s add-on in the Membership Billing tab of their profile. Members can also change their add-ons at any time and will be prorated accordingly. Membership add-ons are included in the recurring run rate figure on the dashboard. They are also included when you export Membership Payments from the dashboard, and when you export membership information from the folders (if you include the Membership levels & labels information).